I thought I would post this picture again. It challenges me on so many different levels. None of us want to be responsible for emptying a church! But it is not enough just to keep it open either… simply to maintain what is for as long as we can. The challenge is to move forward. I don’t like the “change” word much and I try to avoid telling my congregation that things have to change. I prefer to talk about transition… about moving from one thing to another. We cannot go backwards and standing still is not a sustainable option because if we are just “keeping it open” we are effectively “keeping it empty” albeit not this week or even this year. 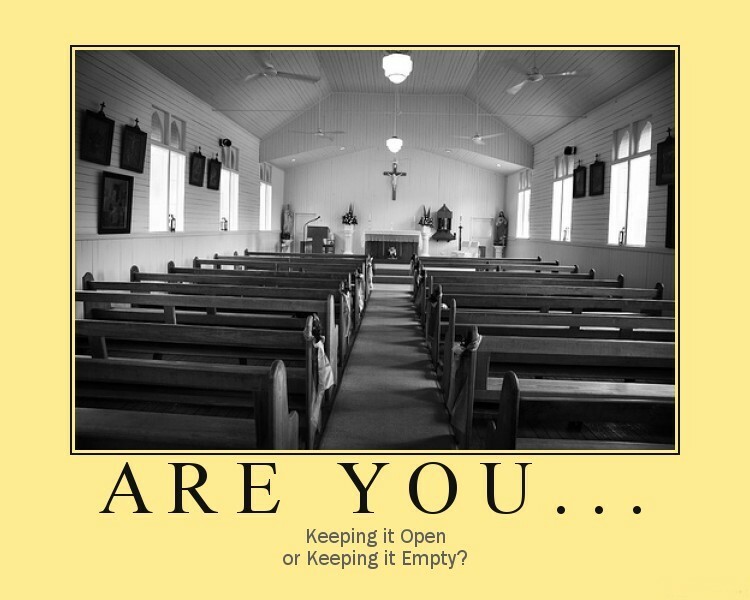 Your church may still be open and on the surface thriving, but given the current rate of decline in church attendance, and the age profile of your congregation, it will eventually be empty! There is no quick fix solution, no easy answer (if you have one please let me know!) But it is a question of focus. Where is your focus? On maintenance ministry? Or on moving forward with the God who seeks to do a new thing with his Church and with his people? Previous The sermon… how was it for you?